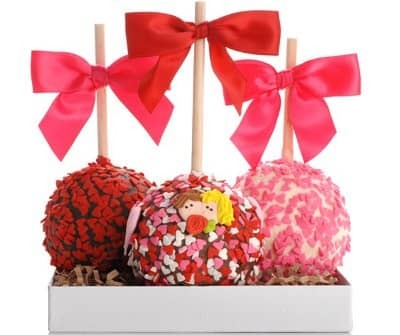 Surprise your loved one this Valentine season with candy apples. Our gourmet candy apples start with crisp apples and decadent toppings and end in true love. This delicious Trio features 3 of our most popular Caramel Chocolate Gourmet Apples dressed up for Valentine's Day! Our crisp, premium Fancy Petite Granny Smith Apples are hand-dipped in our rich golden Caramel then hand-dipped in Belgian Chocolate and generously finished with Valentine Icing Decorations and Candy Sprinkles. Each apple is individually wrapped in a lovely cellophane bag and tied with a fancy Satin Bow. Presented in a Gift Box of 3 on a bed of Krinkle Shred, wrapped in a cello bag and finished with a bow. Net Wt. Approx. 1-1.25 lbs. Shelf life up to 5 days - MUST refrigerate if not consumed in 1-2 days. Ideal room temperature 65-72. Keep out of direct sunlight.